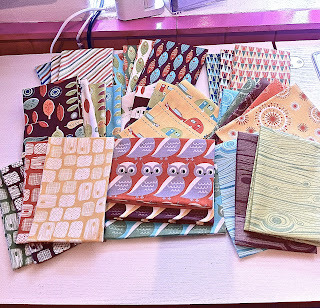 I was recently lucky enough to win a giveaway on Threadbias, and what a wonderful collection of fabrics came in the post. A fat eighth set of S'more Love by Cosmo Cricket. I have no idea what I'm going to do with it yet, apart from look at it and enjoy it. This is a pretty dreadful photograph, but better than nothing. I'll try and get a better picture soon. So, many thanks to Threadbias. My City and Guilds course is nearly finished now and I suppose it was inevitable that after a quite intensive two years I should be getting a bit 'demob happy'. I really didn't want to do the tasks I was supposed to be doing so I made three cushions for upcoming celebrations instead of working. I made this lovely owl cushion for my elder son's partner who has a birthday coming up soon. These two are for some friends who have recently got married. The patterns are all from Bustle & Sew. What a lovely ting to win - and the cushions look beautiful. What lovely fabrics and your cushions look great, they will be wonderful gifts. There seems to be a lot of owl fabric available now. Different looks to them all. I like the pillow you made using an owl print. Wow! I just love the design and bright colors on these creations, Amanda. Beautiful! What a nice looking assortment of fabrics! Congratulations on your win. Your pillows look great. Are the tea posts appliqued?